Controlling electrostatic discharge (ESD) is an important aspect of ensuring the quality of electrical components throughout manufacturing processes. By nature, some electronics are more sensitive to static than others, which is why many manufacturing plants have special environments like cleanrooms for keeping static at the lowest possible levels. While it’s equally important to protect electronics against ESD after manufacturing, such as throughout transport and device assembly procedures, controlling the levels in critical manufacturing environments is the first step to keeping your components intact. While there are many different types of electronics prone to damage from static exposure, hardware is particularly fragile. Network hardware devices, for instance, can become compromised by being exposed to as little as 100 volts of electricity. The damage is permanent and irreversible, thus rendering your equipment unusable and worthless. Just how much electricity does it take to produce 100 volts? Put it this way: walking across a carpet can create as many as 35,000 volts. Imagine how many volts could be produced on a daily basis with countless employees moving about in your organization! Thus, minimizing ESD in your critical environments through all means possible is essential to preserving the quality of your components. Of course, there are other types of electronics which could become damaged by ESD during manufacturing, too. The problem lies in the fact that damage isn’t always noticeable until later, during subsequent testing stages. Therefore, the amount of time and money wasted throughout various in production phases can be significant when components become damaged as a result of ESD. Moreover, the consequences of failed electronics can be devastating depending on the application. While damaged network hardware could cripple your company headquarters’ communications for a day or so, a failed airplane component could have a much more serious, and potentially even deadly, impact. To keep ESD at the lowest possible levels, you likely have an Electrostatic Discharge Protected Area (EPA) somewhere within your manufacturing plant which could range from a basic work station to a full-blown work space. 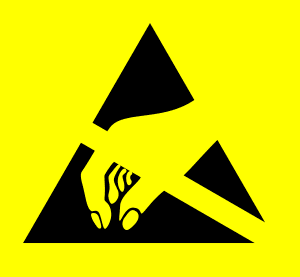 Within this area, all conductive materials should be grounded to prevent transfer of ESD – this includes humans, too. Your printed circuit boards will also have ground planes to give current a return path. There are a broad range of tactics you can use to prevent ESD levels within your electronic assembly environment. From anti-static mats to ESD strip shoe covers and conducting wrist straps, organizations use a variety of tools to keep static out of critical work areas. Many organizations must also adhere to specific air quality requirements to prevent humidity levels from dipping too low (or conversely, climbing too high), which can also lead to ESD. Keeping components in anti-static containers until the moment they’re ready to be installed is another way to prevent static. Finally, one less-thought of – yet equally important – way you can control ESD is through choosing the proper type of swabs. Swabs are used throughout electronic assembly for a number of different purposes. Your employees might use them to apply adhesives, or cleaning small, hard-to-reach places. They also come in handy for surface sampling and validation procedures in cleanroom environments. If your employees use swabs during any stage of the workflow while handling electronics, it’s advisable to provide them with anti-static swabs to further eliminate ESD. Anti-static swabs have all of the benefits of traditional swabs, allowing you to clean fragile machinery and small components, but do not carry the risk of transmitting static to your electronics. These swabs are unique in the fact that they feature special shaft materials which are inherently static-free. For instance, many of these swabs’ shafts contain carbon, which is known to eradicate any static buildup. Common shaft materials for anti-static swabs are static dissipative polypropylene and wood (wood swabs are generally not safe for cleanrooms but could still be used in Electrostatic Discharge Protected Areas or elsewhere. Likewise, the tips are also constructed using materials designed specifically to deter and minimize static discharge. You can choose among ESD microfiber swabs, which are non-linting and safe for use in EPAs, or static dissipative foam swabs. 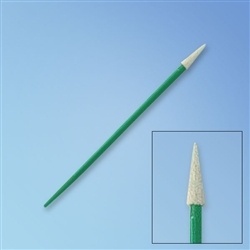 There are also knitted polyester tipped swabs and ESD foam-tipped swabs with anti-static attributes available to meet each environment’s unique needs. No matter your specific needs, Harmony Business Supplies has the right anti-static swab for you. 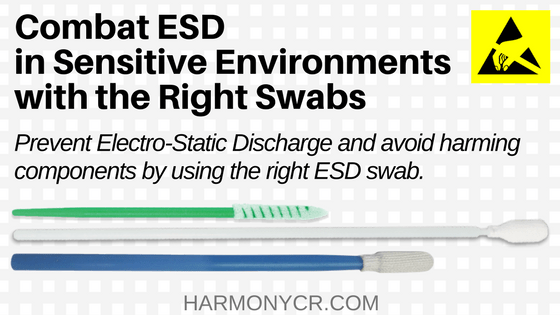 By choosing swabs designed to keep ESD at bay, you can reduce the risk of compromising your sensitive products and potentially costing your organization countless dollars and time in damages. To browse through our vast array of anti-static swabs and other products created for sensitive cleanroom environments, take a look at our website. Still not sure which swabs are the right choice for your needs? Feel free to get in touch with one of our knowledgeable product specialists for help.